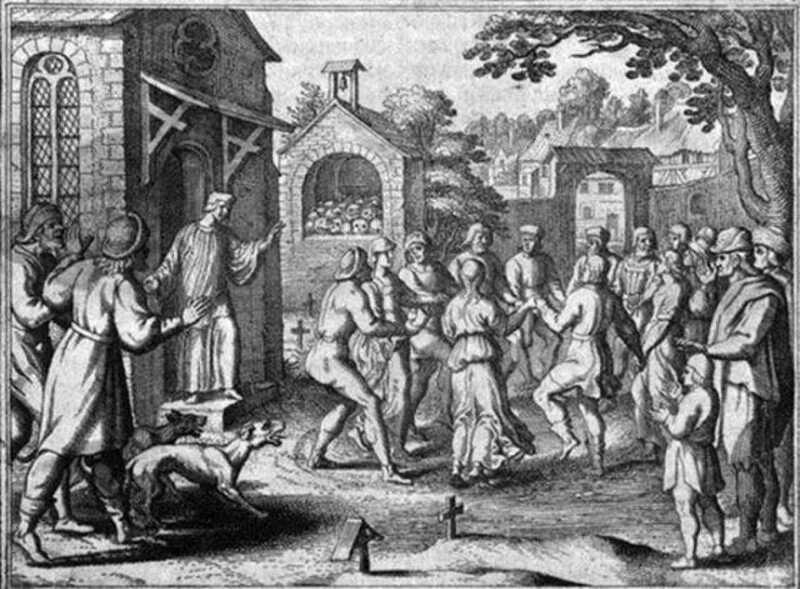 Over 500 years ago, in a town in France, a lone woman took to the streets and began to dance. There was no music to accompany her, no crowds to cheer her on. But, slowly, people began to gather. They watched as the woman’s arms flailed and blood poured from her aching feet. And yet she danced on. After a while, one person joined in, then another. Soon the streets were filled with dancers working themselves into a frenzy of movement. So began a tale as strange and twisted as Hans Christian Anderson’s fairy tale, The Red Shoes. If the story had taken place in a remote village, it could have been discounted as just such a fairy tale. But, Strasbourg was one of the largest cities of the Holy Roman Empire. There are scores of eyewitness accounts, medical reports, and sermons. As the days turned into weeks, more and more dancers joined in, all seemingly possessed by the same bizarre dancing hysteria. By the end of the month, more than 400 citizens of Strasbourg had joined in the manic dancing. It was only when the dancers started dying that the medical and civic authorities began to grow concerned. One by one, the dancers fell to the ground, victims of heart attacks, strokes, or just plain exhaustion. Some reports suggest that as many as 15 people a day were collapsing to their deaths. Instead of forcing the dancers to rest, the doctors encouraged just the opposite. They became convinced that the only way to stop the strange dancing phenomena was to encourage even more of it. Two guildhalls and a grain market were opened and a brand new wooden stage was erected. The authorities even paid for musicians to play for the dancers in order to keep them moving. Although many of the dancers died, a surprising amount were able to continue dancing long past what was expected. Some reports say that Frau Troffea, the original dancer, continued on as long as six days, though dehydration alone should have killed her after three. This is especially notable because of the period of history during which the event occurred. During this time, France was riddled with disease, including smallpox and syphilis. Famine had ravaged the region and many were already suffering from extremely compromised health. And yet… they danced on. Finally, after weeks of frenzied movement, the surviving dancers simply stopped dancing and returned to their lives. One theory is that the dancers had fallen victim to a rare type of food poisoning. A condition called Ergotism, which arises from eating mold-infected rye, is known to cause seizures. The mold is the same substance from which the first LSD was derived. Could the dancers all have eaten tainted bread? But if that were the case, wouldn’t they have suffered from seizure-like convulsions instead of engaging in classic dance step movements? A second theory states that the dancers may have been members of a heretical cult. That perhaps the dancing was some sort of ritual gone awry. However, if they were willing participants, why did so many of the dancers seem visibly upset? Why did they beg for help to stop dancing? A more popular theory claims that the stress of the time period was so intense that the townspeople fell prey to a mass stress-induced psychosis, an idea which is further supported by the superstitious nature of the times. It was known that many of the townspeople believed in a saint called St. Vitus who they believed could invade their minds and cause them to do things against their will… like dancing. Could the dancers have been motivated to join in based on their belief in St. Vitus? Is it possible that they thought dancing would cure them from illness or help relieve the famine? Until a definitive answer to the mystery of the Dancing Plague of 1518 is found, the story will live on as one of the strangest occurrences in documented history.